Babylonian amora of the fifth century; died at the end of Yom Kippur, 468. He achieved a reputation as a teacher of the Law even during the lifetime of his father, Ashi, the famous director of the Academy of Sura (see Ber. 26a; Ḥul. 76b, 98a); and there is an allusion to his marriage, which took place in his father's house (Ket. 8a). Tabyomi was not elected director of the Academy of Sura until 455, twenty-eight years after his father's death, when he was chosen under the extraordinary circumstances narrated in B. B. 12b. He then officiated for the remainder of his life, a period of thirteen years. Tabyomi continued his father's work in the revision of the Talmud; and Abraham ibn Daud mentions him, together with Maremar, as the final redactor of Babli. 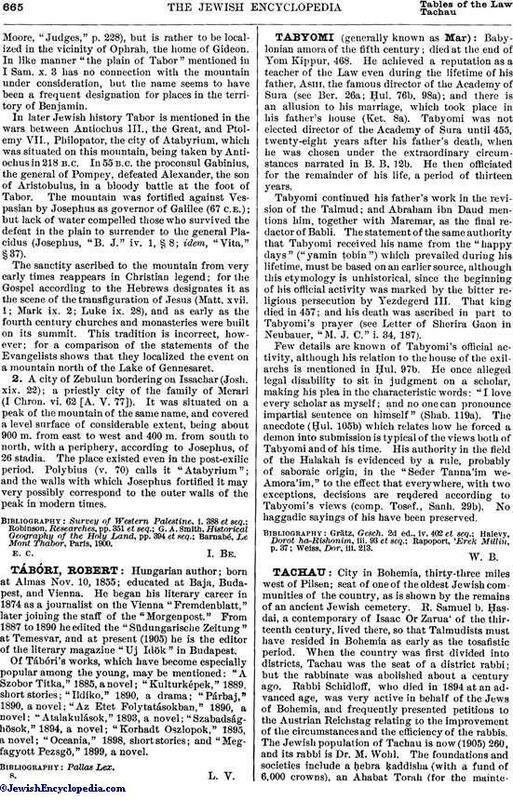 The statement of the same authority that Tabyomi received his name from the "happy days" ("yamin ṭobin") which prevailed during his lifetime, must be based on an earlier source, although this etymology is unhistorical, since the beginning of his official activity was marked by the bitter religious persecution by Yezdegerd III. That king died in 457; and his death was ascribed in part to Tabyomi's prayer (see Letter of Sherira Gaon in Neubauer, "M. J. C." i. 34, 187). Few details are known of Tabyomi's official activity, although his relation to the house of the exilarchs is mentioned in Ḥul. 97b. He once alleged legal disability to sit in judgment on a scholar, making his plea in the characteristic words: "I love every scholar as myself; and no one can pronounce impartial sentence on himself" (Shab. 119a). The anecdote (Ḥul. 105b) which relates how he forced a demon into submission is typical of the views both of Tabyomi and of his time. His authority in the field of the Halakah is evidenced by a rule, probably of saboraic origin, in the "Seder Tanna'im we-Amora'im," to the effect that everywhere, with two exceptions, decisions are rendered according to Tabyomi's views (comp. Tosef., Sanh. 29b). No haggadic sayings of his have been preserved.